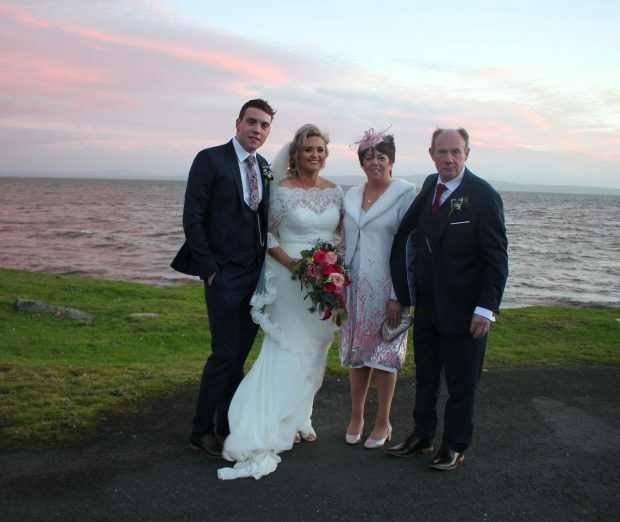 The sea at the foot of the Redcastle Hotel glistened as the autumnal sun set on the wedding of Kerry and James Smith. 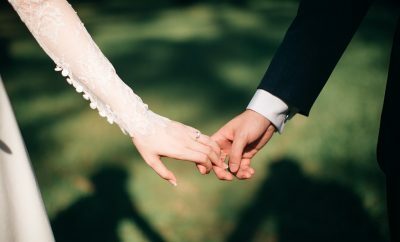 Indeed, with an abundance of lights decorating the windows of the Donegal venue and Kerry’s princess-cut engagement ring shining bright when darkness fell, the couple’s wedding could have been taken straight out of a fairytale. 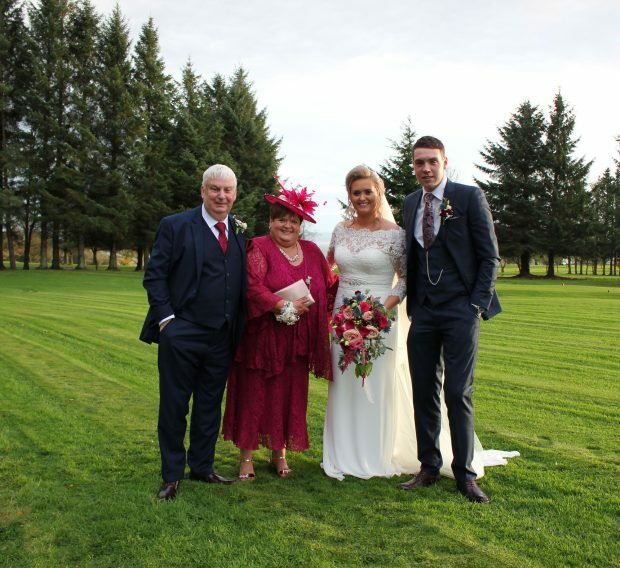 With their family and friends alongside them, the pair were wed by Reverend Jonathan Cowan during a beautiful ceremony at Fintona Presbyterian Church, on November 3, 2018 – almost four years to the day that the pair began dating. Kerry Smith (née Rea), who is a hairdresser from Fintona, explained that she had known of James, a welder and farmer from Castlederg, for many years. 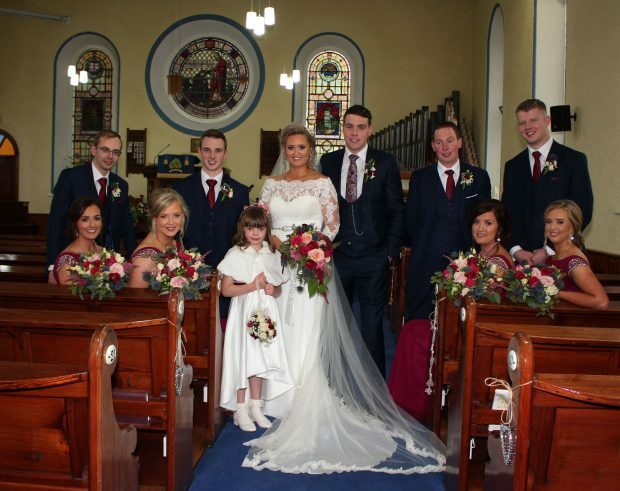 However it wasn’t until November 2014, that they officially met during a Young Farmers’ Christmas Disco held in Hempton’s Bar, Newtownstewart – and it was James’ sense of humour that won Kerry’s heart. Together for two years, it was on November 5, 2016 that James got down on one knee in truly romantic and unexpected fashion. “He surprised me when I came home from work, to a romantic bunch of flowers being left at my house, with a card saying to ‘watch out for a text’,” Kerry recalled. “The text arrived, and it told me to ‘pack a bag’ because James was taking me away for the weekend. “But at this point, I was annoyed as I wasn’t prepared to go away for the night… My hair wasn’t done, and I had no tan on, but I got ready and Jim came and collected me. “We then headed towards Coleraine, so I guessed that it was a night up in the North Coast, which is our favourite place.” The pair eventually reached the beautiful Whiterocks beach, but with winter just around the corner, it began to get quite dark very quickly. “So Jim said, ‘We should go for a walk while there is still some daylight left’, so off we went,” Kerry said. Perhaps just as special, was the fact the venue was available on the date that the couple wanted – November 3. “This was exactly four years from the weekend that we first started dating,” Kerry explained. 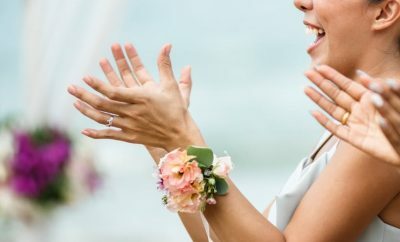 “It was a special date for us.” As well as knowing which wedding reception to choose, Kerry also was certain that she wanted her wedding dress to boast feminine sleeves. And with her mother, Levena by her side because ‘she would definitely tell the truth’ about what looked good and what didn’t, the duo had great fun choosing the perfect gown. “Wedding dress shopping was brilliant,” Kerry said. 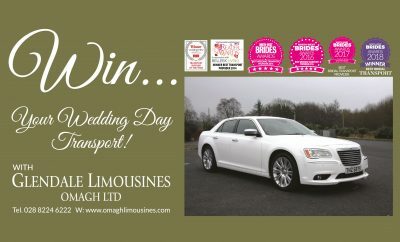 “I told mum that I wanted to get my wedding dress in Serendipity, Fivemiletown; however she had different ideas as she wanted me to have the experience of going to different shops.” However, after visiting two different stores, it was while the pair were driving over the Fivemiletown mountain that Kerry said, ‘Mum, I think I’m going to get my dress here today’ – and she was right. “I had a picture on my phone of what I wanted and it was the very dress I ended up getting in Serendipity,” Kerry said. The skies look dramatic as the autumnal sun shines down on newlyweds, Kerry and James who wed on November 3, 2018. 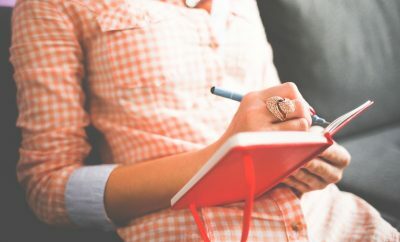 Kerry recalled feeling calm, right up until the night before her wedding – and that’s when her emotions kicked in. “I couldn’t actually believe I was getting married in the morning,” she smiled. “It came around so fast. 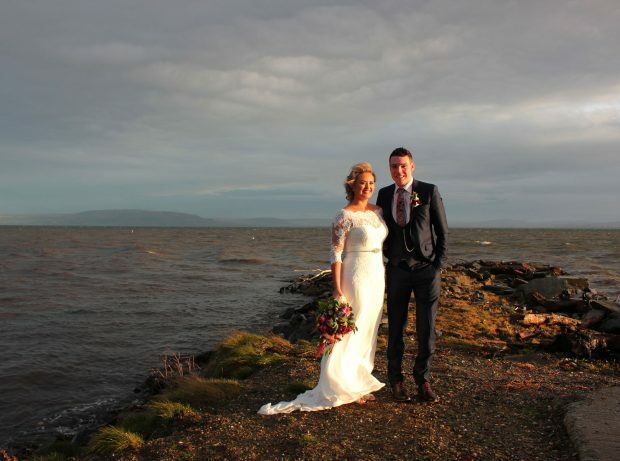 “James was nervous and emotional too, but also very excited.” And while the weather that night was miserably wet and windy, on the morning of Kerry’s wedding day, the clouds parted and it brightened up. “It was the perfect Autumn/ Winter setting,” Kerry reflected. But perhaps the most emotional moment of all occurred when Reverend Cowan spoke of Kerry’s beloved grandmother. “He talked of how we all met at the church five months ago because of the loss of a special lady to us all – my Nanny,” Kerry reflected. 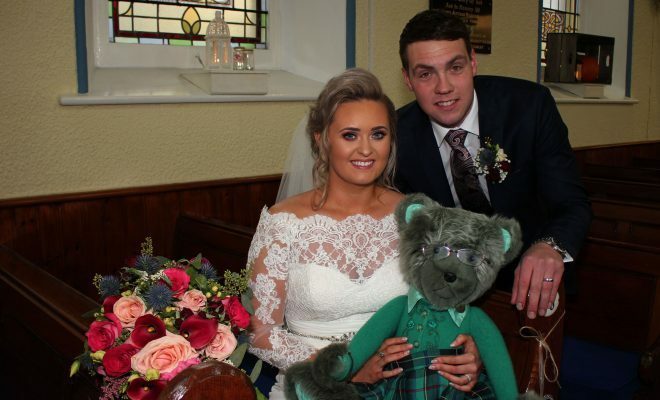 “Because of this, James and I received a special wedding present from my parents; a Coyagh memory bear named ‘Nanny Bear’ which was with us in the church. “Following this, there were a lot of emotions put into our vows, which I think was lovely as it showed how much we meant to each other. “Our wedding was everything we both had dreamed of and more,” the 23-year-old concluded. “We wouldn’t change a thing. It was the best day of our lives which we will remember forever!” Mr and Mrs Smith would like to express their thanks to both the Smith and Rea families and their friends who helped them enjoy a fantastic wedding day. Engagement ring: Bonds Jewellers, Coleraine. Wedding ring: Bonds Jewellers, Coleraine. 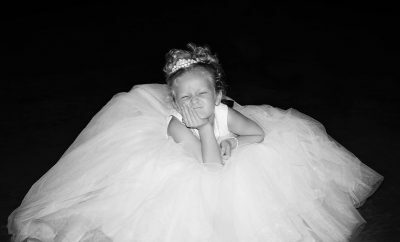 Veil: Serendipity Bridal Boutique Fivemiletown. Headpiece: Sarah Deering, who included Kerry’s grandmother’s wedding day pearls in the design. Bridesmaid dresses: Perfect Night, Lurgan. Groom’s/groomsmen’s suits: Tux and Tails, Dungannon. Cake supplier: Kathleen McCrossan Cakes, Moville. Florist: Flower World Pollocks, Castlederg. Reverend/ Priest: Reverend Jonathan Cowan. Number of guests at reception: 215. First dance song: ‘I Was Made for Loving You’ byTori Kelly featuring Ed Sheeran. 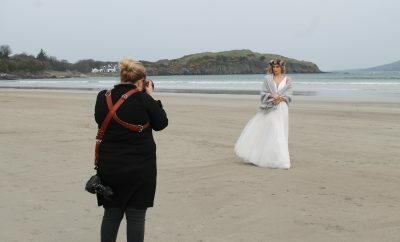 Videographer: Gra Films, Barry Donnelly. Other entertainment: Scene Setters Photo Booth. Honeymoon: New Zealand for four weeks next year.